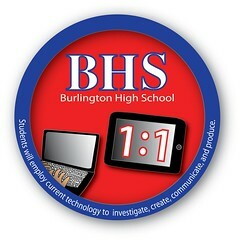 Burlington High School Principal's Blog: A World Record For BHS!? A World Record For BHS!? On Saturday, September 17, 2011 we broke a world record at Burlington High School! At least we think we did. One hundred of our students took a practice SAT test using with an iPad as an answer sheet. This allowed every student to get instant score results from their test taking experience. No one tracks these things, so we can’t know for sure if it was a record, but we’re pretty certain. Only two weeks into our 1:1 experiment, it’s exciting to be able to offer students unique learning experiences that take advantage of our technology. I also wanted to congratulate our students. The report I got from the company hosting the test was that our students showed exceptional grace and adaptability around taking a test in a new way, using a new technology. Lengthy standardized tests are stressful enough without unfamiliar technology, and I commend everyone for making such a positive impression on the test developers. The test experience also represented a great chance for Burlington High School to help develop newtechnologies. The test was hosted by local start-up Testive. They are developing a rapid version of the SAT that can provide a diagnostic to students and schools much faster than the full length test. Our partnership allows them to better calibrate their tests and us to offer opportunities to our students. We now have less than one week left until the first Fall administration of the actual SAT. Good luck test takers.